Note: While this review will be spoiler free, it will reference events in earlier books. If you haven’t started the Broken Destiny series, check out the VBC review of The Beautiful Ashes. When I read the first book in the Broken Destiny series, I likened it to Supernatural. The Brightest Embers doubles down on that similarity in a glorious fashion while packing in so much romance and a heroine who will not allow others to define her or set her course. 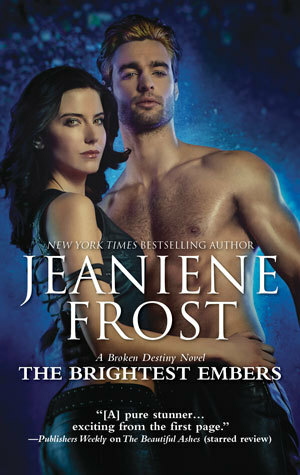 Basically, The Brightest Embers is nonstop adventure of a book with fights that literally bring the roof down and the kind of romance swoon-y scenes that you’ll want to bookmark for re-reads on cold nights. The end of The Sweetest Burn threw some major kinks into everyone’s plans. Ivy and Adrian got married! (I am still excited about this scene months later.) But then Adrian learns he’s part demon, and freaks out over it. Ivy freaks out, too, but for different reasons. So here we are with the two of them searching for the final object to defeat the demons. They’re newlyweds, which means they are learning more about each other, but they’re also discovering more about who they are as individuals and what their abilities are. Adrian struggles with wanting to help his wife, and wanting to protect her. He frets over what his demonic side will do to her, to them, to the world. …and Ivy just wants to be let in on what he’s thinking. Their emotional journey is the heart of this book, and it’s utterly captivating. Ivy also would really like to save the world without dying. That part is pretty high on her list, too. She and Adrian’s adventures trying to find the last hallowed object add in this extravagant road trip layer to the book. So many beautiful sights, so many vivid settings. This book will make you want to travel. The Ice Hotel is going to be on your list. So prepare yourself. I haven’t been as binge-y about books lately (heyyyy deadlines), but once I started this one there was no stopping. When you finish a book at 4 a.m. you know it was fantastic, which is even better as this book closes out a trilogy. The ending is satisfying, definitive, but also gives us a little gateway of a hook for a spinoff (no spoilers!). If you want a book with a madcap pace, a serious adventure, and all the feels, you will glom The Brightest Embers.